The other day while reading Facebook posts, my friend Eric McGarrah sent me a message about applying for the Ultimate Race to Give, sponsored by BMW of Des Moines and Zoom Performance. What it listed seemed almost too good to be true. 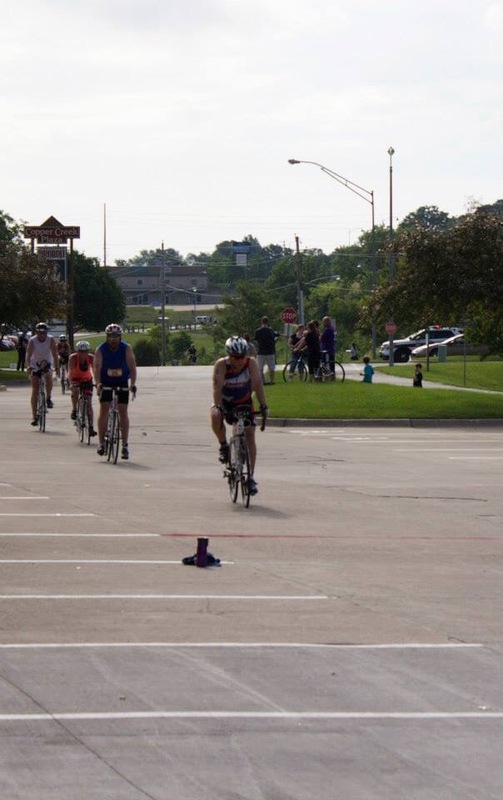 If selected, you receive training from a world-class triathlon coach from Zoom Performance, a open-water swim clinic, a transition clinic, running assessment, gear to wear at the event from BMW of Des Moines, paid entry in the Des Moines Triathlon, and a membership in the Des Moines Tri Club (I’m already a member!). You even get the use of a BMW for a weekend! Doesn’t that sound amazing?? Then there’s the “catch”. For my part, other than training is that I have to raise $1000 for the charity of my choice. Wait, what?? I get to choose what charity I raise money for?? That’s incredible! There was no thinking it over, I sent in my request to be considered right away! That evening, I told my wife about entering and she entered too! We laughed on how cute would it be if we both got accepted, then we discussed the charities that we wanted to work for. I chose the Animal Lifeline, a special needs no-kill shelter in Des Moines that Julie and I have donated to for years. We even adopted our Great Dane Murphy from the Animal Lifeline (Maverick the Weimaraner and Max the miniature Dachshund were adopted from the Animal Rescue League of Iowa). Julie selected the Heinz 57 Pet Rescue. So, now that we selected a charity, all we had to do was wait. It wasn’t long before we received an email asking us to fill out a questionnaire. It asked your athletic accomplishments, who you wanted to raise money for, why did you pick that charity, was I on social media, how would I raise money for my charity, etc. It was rather short, and I was surprised that it didn’t ask a lot more questions. So we both answered the questionnaire and sent it in. A few days later, I got the news. I got selected!! I was so pumped, I emailed back thanking them and wanted to know if I could start the fundraising right away. Then I called my wife and told her to check her email…she didn’t get a letter. I told her to look again, and look for the name Cameron Denucce. She said she would look again, but had to get back to work. My heart sunk. I was hoping we could train together. When she came home, I greeted Julie at the door with “Did you check again?” The look on her face gave it away…she got accepted!! She missed it the first time. We would be training together for a triathlon. 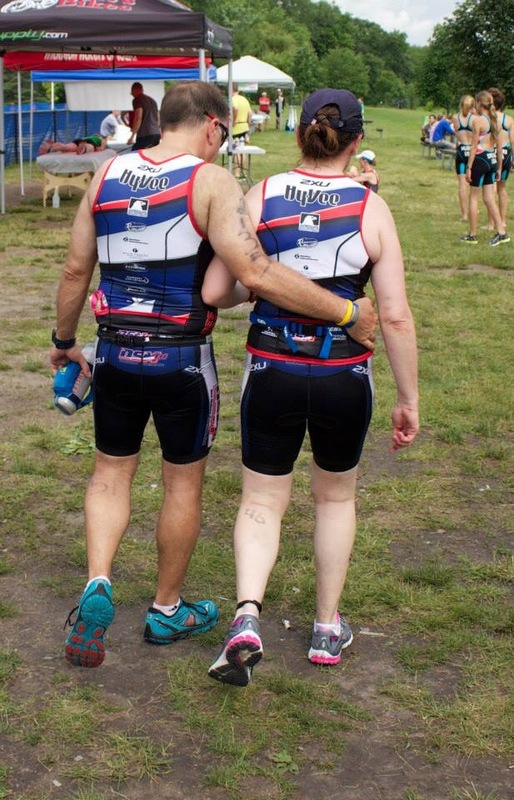 I knew I wanted to do the Olympic distance, but what did Julie want to do? Her answer surprised and impressed me: she wanted to train for Olympic distance as well. This past Friday, BMW of Des Moines invited us to a kickoff celebration. Unfortunately, Julie had to work, but I went and met Cameron and Craig from BMW, Matt and the coaches from Zoom Performance, and the rest of the team that I would be training with. They selected 8 people, and Craig said that they wished that they could have chosen more, but that they were impressed with our accomplishments and our charities that we selected. When Craig said “accomplishments”, it got me wondering. I’ve always set goals: run a half marathon, run a full marathon, run 1000 miles in a year (originally 750, but I had passed that mark before the year was out), things like that. Then it’s on to the next goal. I guess I never really looked at them as an athletic resume of sorts. Then Cameron asked all the athletes to gather for a group photo. I just stood there until Craig said “You better get in there”. They were referring to me?? I never considered myself an athlete, just someone who works out. We gathered for photos, and then a team meeting. It was exciting. Before we left, Cameron gave us these awesome BMW gym bags to store our gear in. It can also serve as a huge backpack! It has more pockets than I know what to do with! We also got our entry into the Des Moines Triathlon, and details on the use of the BMW for the weekend. Before you knew it, it was time to head home, but we were told that training started on Monday. I couldn’t wait! Now, let me tell you a little about the Animal Lifeline of Iowa. One Christmas Eve, we stopped at the Animal Lifeline to drop off food for the dogs and cats. The volunteers asked if we wanted to see the puppies and kitties, and of course we did. There was a blind Bassett Hound that had great hearing and an even better sense of smell, especially when a treat was near! He was scheduled to be adopted, so that was good. Then we were told that we had to be quiet when entering the next room, as this dog was hit by a car and had pins in her hip. They didn’t want to get her too excited. I imagined a poor dog laying in a cage, all alone and in pain, but what I saw shocked me. There was the poor dog, laying with pins holding her broken hip and leg together, gently wagging her tail. The reason why she was wagging her tail? Because a volunteer was sitting in the kennel next to her reading to her! We found out later that they took shifts staying with her until she was healed. That meant all through Christmas Eve, Christmas, and New Years Day that dog was never alone. She was loved and cared for like never before (she was later adopted). Here is a picture of the awesome athletic bag that BMW of Des Moines gave each of us! So much has gone onn recently, that I see I haven’t been keeping up to date on my blog. 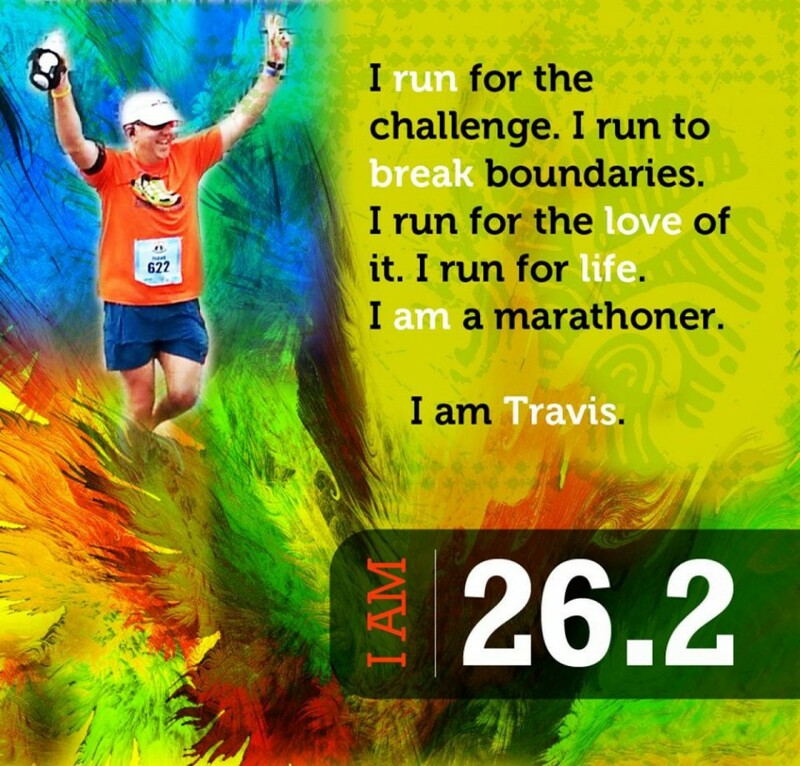 First off, let’s talk about the Dam to Dam half marathon that I ran on May 30. It was a cold and wet start to the race, and since the porta-pottiy lines were so long, I had to run 1.5 miles until I had to stop. 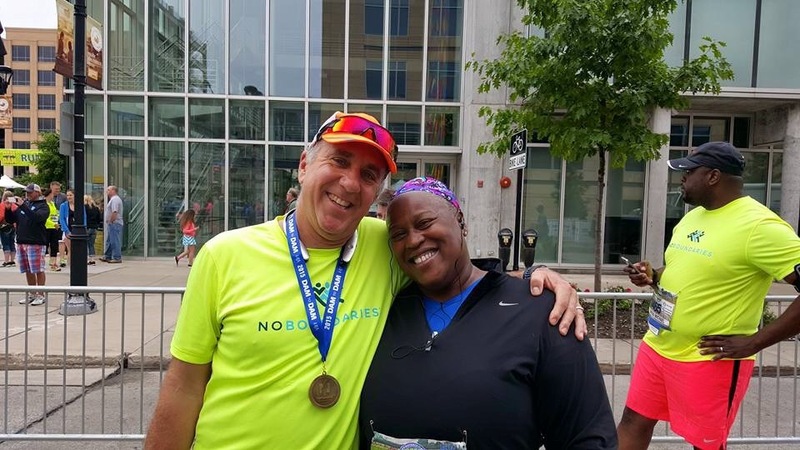 I lost some time, but I had 2.5 hours to finish the race so I could meet up with the group I mentor in No Boundaries and run their “graduation 5k” with them. I really wanted to be there with them, and that was the driving force behind my run. Even with a potty break, I finished in 2:14 and found the group. I even had a moment to catch my breath before we started out again. It was a wonderful day! 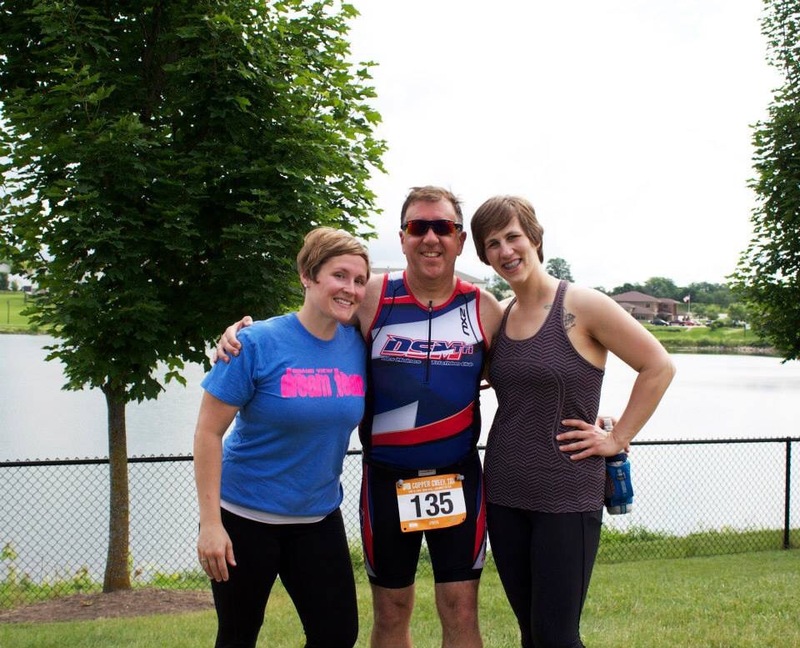 Sunday, June 14 was the day of the Copper Creek Triathlon. 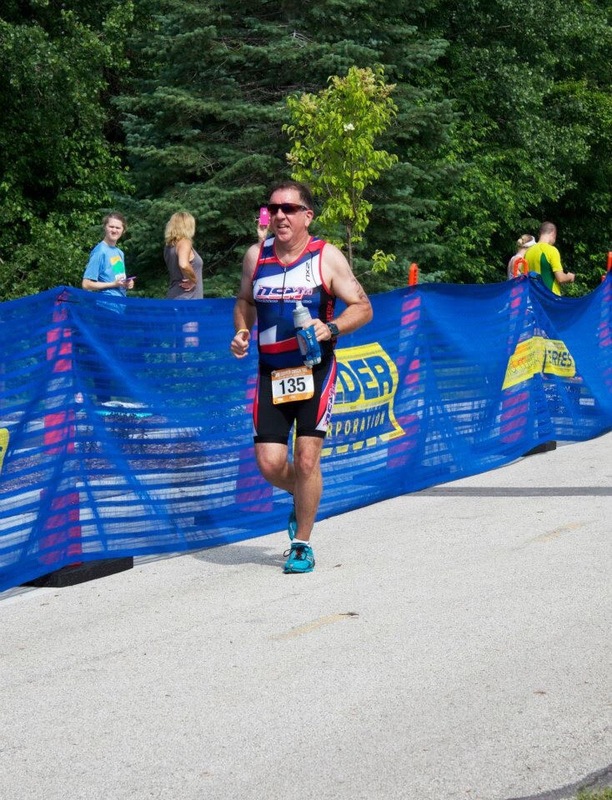 It’s a sprint triathlon with a 750 meter swim (820 yards), 20k bike ride (12.4 miles), then a 5k (3.1 mile) run. I’ve been worried about this event, as it was going to be my first open water swim. I have only done triathlons in a pool, but this was in a lake with waves of swimmers taking off. It was hard to keep my nerves in check in the days up to the race. We prepped the bikes and had our bags packed and loaded the night before (my wife competed as well). All that was left was to relax, watch the Blackhawks in the Stanley Cup final (they won and lead 3-2) and go to bed. But sleep would not come. I was going over scenarios of what could happen in the lake. I wasn’t worried about the bike or the run, it was the lake that had my full attention. Finally the alarm went off: 4:00 a.m. Time to clean up, eat, and drive to the parking area for the opening of the transition area so we could set up. You could feel the nervous tension in the truck, as it was my wife’s first open water event as well. We got parked, and the first problem reared it’s ugly head: I had a broken wheel spoke. I didn’t have time to remove the spoke, as that would have required taking the tire off. But I couldn’t leave the broken part dangling, as it could possibly poke a hole in my inner tube and cause a flat tire, ruining my day. So we improvised: we bent the short part of the spoke untill it rested on the rim, and we used electrical tape to hold it in place. It was far enough back so it wouldn’t touch the brake area, so I said a prayer and headed to transition to rack my bike. Once we were set up, we milled around until it was time to get into our wetsuits and line up for the swim. I was also getting hungry, as I had eaten breakfast at 4:30, and the race started at 8:00. My heart and mind were racing, thinking about running into that water. I was in wave 4, and I heard the announcer say “Wave one, in the water”, and I thought we were starting. But they made wave one wait between two buoys… they were treading water before beginning! I have trouble treading water even in a wetsuit! That didn’t help the nerves. Waves two and three did the same routine; tread water until the cannon blast told them to start. Suddenly it was wave four’s turn. I got out to chest deep water when I heard the marshall say “You have three minutes.” I spoke to a couple of others in my wave, and we decided to stay back until one minute was called. When the marshall gave that call, we swam out and treaded for 20 seconds until the cannon blast. We were off! I tried to stay to the outside of the pack, knowing I would be slower and I didn’t want to get overrun by faster swimmers. My nerves had my heart rate going, and I was finding it hard to breathe. I used my inhaler earlier that morning, but this felt like an asthma attack. I wondered why I thought I could do this, and how could I get out of here. Then I thought of everyone who has encouraged me, supported me, and helped me on this journey. I could not give up until I reached the first buoy, that much I knew. It took forever for that buoy to get close, and when I made the turn I could see buoy #2 a short distance away. I thought that if I quit there, I at least made it half way. Suddenly, I was halfway! I started to calm down, I gained control of my breathing, and decided to take my time and finish this thing. Then in the midst of feeling good about swimming, another problem came up… I was swimming in seagrass. I used someone else as a spotter, and they were off course. So I needed to angle over to deeper water and sight buoy #3 for myself. It took a little effort, but I finally made the turn and was heading for home. I could see the exit, but it never seemed to get closer. I thought surely I would touch ground and run out, but this lake was deep where the exit was, and I almost swam up to shore before I stood up. I had made it! 820 yards with others all around me, and I made it! The time for the swim: 16:11 – pace: 2:10 per 100 yards. I ran slowly to transition. I felt as if I was out of gas, but I has to keep moving. I ripped off my wetsuit, donned my helmet, put on socks and bike shoes, and ate a Huma Gel. I shoved some Honey Stinger chews in my back pocket (I wore my tri suit under my wetsuit) and ran out of transition. The ride was 12 miles, but I was not expecting as many hills as they had. We followed USAT rules regarding no drafting and no blocking. That meant you had to pass within 15 seconds or stay 3 bike lengths behind another rider. There were marshalls on motorcycles travelling the course and writing out penalties. We rode out and back, and one steep hill I had conquered would give a fast ride down on the way back. When I reached that part of the race I remembered: I had a broken spoke to worry about. If I blew out a tire now, the results would be catastrophic. So when I hit 31 miles an hour, I started lightly pumping the brakes to keep me from going any faster. 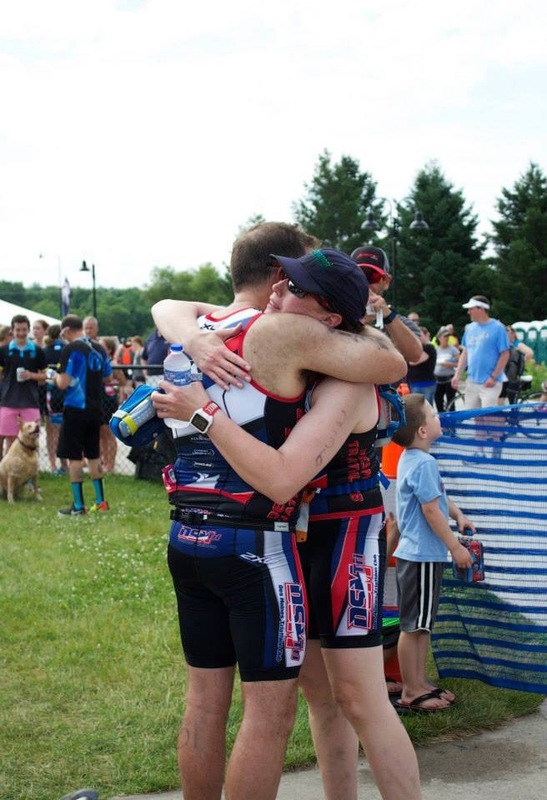 I was happy to see transition for two reasons: one, that worry was behind me, and secondly because my mentor Stephanie and my training partner Kara was there to greet me. It was an awesome surprise, but hellos would have to wait as I had a 5k to run. Transition 2 went fast: off went the helmet, gloves, and bike shoes; on went the running shoes and I grabbed my water bottle. The run was an almost steady incline up, followed by a decline and a lap around the lake. My legs were about done after the ride, but as I rounded the first corner, I saw my friend Jodie and her husband cheering me on. They had stopped by the transition area before the race to wish me luck, but I didn’t think I would see them on the course, or that they would still be there. That helped the legs feel a little better. Before I knew it, the halfway point was in view. I turned and headed back for the finish. One long path around the lake, and I saw the finish line. I heard the announcer say my name. I made it. I did it! Total for the triathlon: 1:37:33 with no penalties. I went and hugged my friends Kara and Stephanie, and we watched together as Connie McGarrah, a friend whom I admire for all the success she has when training and competing, crossed the finish. Then my wife Julie crossed the finish line. Julie was pretty emotional after she crossed the line, and she has a right to be. Having back issues like she does, and still trains and competes in an event like this is simply amazing! Now we train until the next one. The way it sounds, it may be sooner rather than later!